Pemuteran is a small collection of resorts located on the beach around 15 minutes east of Menjangan Island. The diving here is on 500 meter wide coral covered banks or mounds that go from the sand floor, at around 25 meters, up to about 6 meters from the surface. The three reefs, Pura Tembok, Close Encounter and Napoleon Reef are all located close to the resorts in Pemuteran. The slopes are dominated by soft corals, sponges and sea fans. Close by at 22 meters lies the empty 16 meter long hull of a scuttled dive boat, generously "donated" by one of the local Bali dive operators. The spot also makes a good night dive loaction. 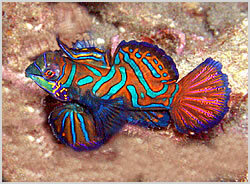 Pemuteran house reef can reward the diver with colorful Mandarin dragonets that can be seen in the late afternoon. This is the time they come out from their hiding places to forage for food. Sometimes shortly before night falls they rise up and do a mating dance together which is truly spectacular. In 1998 the House Reef at Pemuteran was devastated by El Niño. So three years ago, this reef became the first in Bali scuba diving to be sponsored by an artificial re-generation project fund. Large holding domes were sunk with live coral samples. The reef receives electronic stimulus from shore and responds with remarkable growth rates. The local village have buoyed the area and guard it as a no-fishing exclusion zone, so that fish stocks can re-group too. So far, although still incomplete, the project has proved a well-deserved success. Getting there : Beach dive Pemuteran.